Sandi is a supervisor and member of our tax team, based in the Dundee office, but covers all other offices as required. 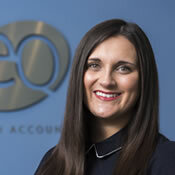 She is a fully qualified Chartered Tax Adviser, with a background in both personal and business taxation. Sandi provides tax compliance and planning services to a wide range of clients, including individuals, partnerships and companies. She also regularly advises clients on Research and Development Tax Credits, Capital Gains Tax, and all aspects of Property Taxation whether commercial or residential.